Note, limit of 6 per customer. Item is brand new. 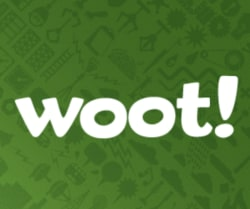 Woot has various chocolate bars on sale, starting from $4.97. Shipping is free if you have Amazon Prime. Plus many more HERE [woot.com]. Light My Fire by Morakniv Swedish FireKnife with 3.75″ Stainless Steel Blade and Fire Starterer $18.60 @ Woot! Note, limit 10 per customer. Woot! Has the OG Version of the Pixel XL (Silver and Black) for $249.99. Not the best deal, but a respectable one. Woot.com has Apple Certified Refurbished 2017 iPad Pro 10.5" for sale in Gold, Silver and Rose Gold. All are 64GB models, larger sizes are not available. 1 year Apple backed warranty is included.